16 talented artists will come together on the evening of Martin Luther King Day, and use one of his quotes as inspiration to create a new piece that they will share with us to celebrate his life and legacy. 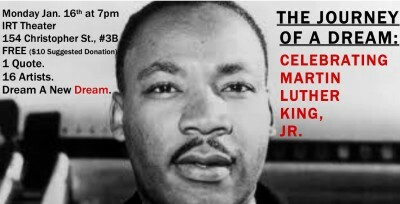 This evening of new work will be sure to breathe new life into everyone in the audience as these artists will continue the journey of the Dream Dr. King first had, while also manifesting new Dreams for today and the generations to come. Don’t miss this.